Yesterday Minister of External Affairs Sushma Swaraj announced in Rajya Sabha that the 39 Indians missing in Iraq were confirmed to be dead. 39 of our citizens were killed by ISIS. As expected the opposition and the media soon went into a spin overdrive. The media started quoting the family members of the victims on why they were not informed before and why the government kept on giving them false hope. One media house quoted a victim’s kin saying, ‘we were made to undergo DNA tests’. Media even started quoting Harjit Masih, the lone survivor who had escaped under a Muslim name and false identity declaring that he had already told they were dead. The eloquent Shashi Tharoor joined in too. Though the MEA explained the long and arduous process the ministry, especially MoS General VK Singh went through to trace those people and establish without a shred of doubt that they were, in fact, dead is being convincingly ignored by the media and the opposition both. ‘Dead’ is a finality. An absolution. The ministry of external affairs made sure that it has exhausted all resources, availed all means of investigations and employed every possible verification process before they arrived into that absolution and finality of announcing someone’s dear one ‘dead’. Sushma Swaraj and her team are heroes. ISIS took control of Mosul in June 2014. Days after that, Indian officials in Iraq informed that they have lost contacts with the 40 Indian citizens employed in Mosul in a construction project. In July 2014, 46 nurses in Tikrit were set free. This further raised hope of those 40 workers being alive too. In May 2015, almost a year later, Harjit Masih claimed he was a lone survivor and the others were shot dead. Despite media repeatedly giving Masih his ‘didn’t I say so’ moment, the fact remains that he lied. Harjit Masih told the press that all Indian workers were taken to a jungle and shot. That was not true. He had escaped with the 55 Bangladeshi workers using a fake name. A fake Muslim name. Interestingly, that is one angle none of the opposition or media is willing to discuss. The uncomfortable truth: ISIS set Muslims free and killed non-Muslims in cold blood. The fact is, the other 39 Indians were not shot as Masih claimed. They were taken to a prison in Badush near Mosul. When PM Modi met the Palestinian President Mehmood Abbas in New York he was informed that the Indians might be alive. The government of India had also heard from other sources that they were still alive. As of July 2016, Ms Swaraj had information that they were alive and being used as bonded labour for construction and farm work by ISIS. 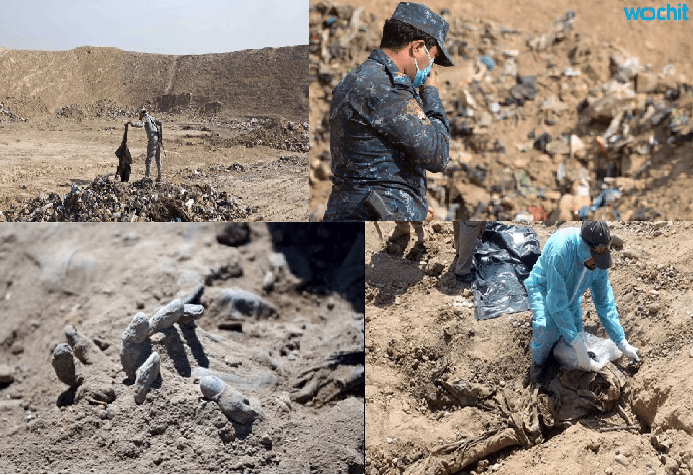 The above is a picture of how mass graves in Iraq looked like. Imagine tracing the movements and final known location of individuals when Mosul had fallen. Going to the war-torn and chaotic Iraq to convince the authorities to spare personnel and resources to trace the possible locations of Indian who might have been there. Then contacting and pursuing the concerned authorities and individuals working in those mass graves and finalise the possible locations, all the above-mentioned things is what General VK Singh went through to finally conclude that the mound at Badush may contain the bodies of the Indian workers. All this was possible only after July 10, 2017. When Mosul was liberated from ISIS. When VK Singh went to Badush with Iraqi authorities, they were informed by locals about a mound where a mass grave was expected. With the help of Iraqi officials, the mound was exhumed and several remains were discovered. The presence of some ID cards, long hair, kadas (bracelet) and non-Iraqi made shoes suggested they might have belonged to Indians and so the bodies were sent to Baghdad. The martyr’s foundation in Iraq asked for DNA samples from relatives of the victims to confirm identity. After identity was finally established and informed to the Indian government, then only Sushma Swaraj informed in the Parliament about the death of those 39 people. Sushma Swaraj had mentioned the difficulties the MEA had to encounter for confirmation. Iraq was and is in chaos. We Indians should consider ourselves fortunate to have an MEA like Ms Swaraj who did not give up. Unlike the UPA government who gave up on Sarabjit Singh, this government is still fighting for Kulbhushan Jadhav. The people who are questioning the government’s intention should question themselves. Should the government have relied on false and contradictory statements of Harjit Masih alone and declared the 39 Indians dead? Should the government, despite information that they were alive after Masih escaped, informed the families of the victims that their loved ones are dead? Should the government have ignored the numerous sources that kept informed of the possibility of the 39 people being alive? Should the government have not used all resources available to trace the last known location and possible place of death of these people? Should the government have not waited for conclusive DNA evidence before declaring someone dead? There are numerous instances where forgotten Indian soldiers were later found to be alive. Sepoy Jaspal Singh who fought in 71 war was later found to be languishing in Oman jail. What is most disheartening in this whole case is how conveniently the Indian media and Congress, in particular, are deliberately ignoring to condemn and point out the very reason the 39 Indians are dead, the ISIS. None of the Congress leaders who have been vocally criticising the government after the announcement yesterday has condemned the ISIS so far. None so far have discussed the brutality of Islamic terrorism. The story of the 39 Indians killed in Iraq is tragic. They went there looking for work There were reports that they had paid middlemen and agents lakhs of rupees to go and work in Iraq. Such was the necessity of employment that they even ignored the warnings by Indian and Iraqi officials to leave the country. While they worked in prison they might even have hoped that the ISIS would set them free. There are a dozen tragic tales of poverty, lack of jobs and exploitations here. But blaming the government for lack of efforts or lack of intent is absolutely wrong. General VK Singh will soon leave for Baghdad to bring the last remains of the 39 people back home. That will be a finality. Their families will never have the joy of their presence but the MEAs relentless efforts will give them closure. Sushma Swaraj and her staff have left no effort spared in establishing confirmation of their deaths. She had stated again and again that she won’t declare them dead until it has been conclusively established and she deserves our applause, for not letting go, for not giving up. Regardless of what the media portrays, the family of a person never truly believes their loved one is dead until they see conclusive evidence. Sushma Swaraj has done the same. She kept hopes and efforts alive till the last moment. The MEA deserves our salute.